During routine sampling of bulk raw milk on a dairy farm, the pathogenic bacteria Listeria monocytogenes was found to be a contaminant, at numbers < 100 cfu/ml. A strain with an indistinguishable pulsed-field gel electrophoresis pattern was isolated from the bulk milk two months later. Environmental swabs taken at the dairy environment were negative for the presence of L. monocytogenes, indicating a possible case of excretion of the L. monocytogenes directly into the milk. Milk samples were collected from the individual cows and analysed, resulting in the identification of L. monocytogenes excretion (at 280 cfu/ml) from one of the 4 mammary quarters of one dairy cow out of 180. When the infected cow was isolated from the herd, no L. monocytogenes was detected from the remaining herd. The pulsed-field gel electrophoresis pattern of the strain from the individual cow was indistinguishable from that originally isolated from the bulk milk. The infected cow did not show any clinical signs of disease, nor did the appearance of the milk have any physical abnormalities. Antibiotic treatment of the infected mammary quarter was found to be ineffective. This study shows that there can be risks associated with direct contamination of raw milk with L. monocytogenes. Listeria monocytogenes is a pathogenic bacterium that can cause Listeriosis in humans and various animal species. In humans, foodborne L. monocytogenes causes large outbreaks of Listeriosis, with a mortality rate of 9% to 44%. In a wide variety of host animals Listeria infection has been confirmed in more than 40 species of domestic and wild animals including birds. The most susceptible domestic species are sheep, goats and cattle. Listeriosis manifests itself clinically in ruminants as encephalitis, neo-natal mortality (abortion) and septicaemia. The most common clinical form in cattle is encephalitis, in general, small numbers being affected (8-10% of the herd) with the animals surviving from 4–14 days. In animals, susceptibility to infection with L. monocytogenes has been attributed to decreased cell-mediated immunity associated with advanced pregnancy. L. monocytogenes has the ability to invade both phagocytic and non-phagocytic cells, to survive and replicate intra cellularly, and to transfer from cell to cell without exposure to humeral defence mechanisms. In raw milk and the dairy environment, the source of L. monocytogenes contamination is mainly from poor silage and bedding[3, 4]. On the farm, contamination of L. monocytogenes can spread from the environment to the animals and also from animal to animal[2, 5–7]. Contamination of milking equipment with bovine faeces can also occur. During storage of raw milk on the farm, L. monocytogenes can grow and multiply, even at refrigerated conditions. Udder infection with L. monocytogenes is most commonly reported in sheep and goats; L. monocytogenes bovine mastitis is less commonly reported where sub-clinical mastitis in cows can go undetected[11–16], where their milk remains visually unchanged, and with no clinical signs contamination can normally persist even after treatment. Most cases of human listeriosis are foodborne related. The occurrence of L. monocytogenes in raw milk was reported as 4.8%, 6%, 3.4% and 6%, respectively[6, 18–20]. Raw milk can be contaminated from the environment or by direct excretion into the milk, therefore, consumption of raw milk is associated with increased risk factors. None of the above studies indicated the source of milk contamination, but it was most likely from the environment. The aim of this study was to identify the source of L. monocytogenes that was contaminating bulk milk at farm level. Environmental samples were collected from non-milk contact sampling sites including pipes, tanks, drains, floors, and walls. Environmental samples from milk contact points were collected from bulk milk filters and from a milk spill area on the floor of the dairy beside the bulk tank. All swab samples and milk filters were collected as previously described. To investigate L. monocytogenes contamination of milk, the herd of 180 individual cows was divided into 9 groups with 20 cows in each group. A composite sample was taken aseptically, in sterile containers, from each group and analysed. Within each positive sample from the groups, each of the 20 individual cow’s milk was sampled and analysed. Where milk from a cow was positive, milk from the four quarters of the mammary gland was sampled and analysed. The presence/absence of L. monocytogenes in all milk and environmental samples was analysed using an AFNOR validated “One step enrichment broth” method (Oxoid FT0401). This AFNOR validated method has been shown to give equivalent results to ISO (11290–1:1997). Milk samples were enumerated for L. monocytogenes by direct plating of the milk onto selective agar (Brilliance™ Listeria Agar; Oxoid CM1080). Typical L. monocytogenes colonies (which are blue-green with a surrounding precipitate) were isolated and purified by re-streaking on ALOA agar (Agosti & Ottaviani Listeria Agar; LabM, Lancashire, UK, HAL010), followed by streaking on tryptone soy agar (TSA). Single pure isolated colonies were grown overnight in tryptone soy broth (TSB) and frozen in cryovials in a glycerol/TSB mixture at −20°C. Bulk milk and L. monocytogenes contaminated milk samples were tested for quality parameters. The pH was measured using BS770:5:1975 with an Orion pH meter model 420A. Enumeration of total bacterial counts using ISO 6610:1992 method with Milk Plate Count Agar (Oxoid CM0681), coliforms using method ISO 4831:2006 on VRBL agar (Oxoid CM0968) and S. aureus using method ISO 6888–2 with Baird Parker Rabbit Plasma Fibrinogen agar (Oxoid CM0961). The fat, protein, lactose, casein and Somatic Cell Count (SCC) were measured by infrared analysis (Milkoscan 605, Foss Electric, Denmark). All purified isolates were confirmed as L. monocytogenes using Real-Time polymerase chain reaction (RT-PCR)[21, 22]. 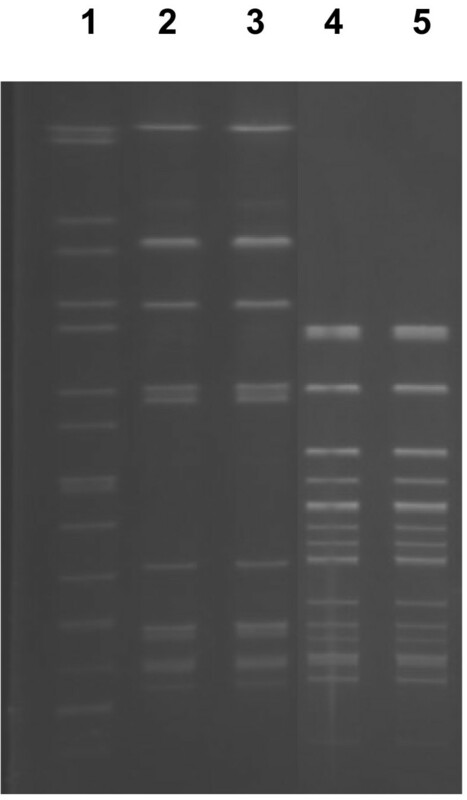 Pulsed-Field Gel Electrophoresis (PFGE) of all L. monocytogenes isolates was performed with the restriction enzymes Asc I and Apa I, in two separate experiments, using the standard PulseNet protocol. Serotyping of the isolates was performed using a combination of antibodies and serotype-specific PCR. The infected cow under examination was physically examined and medically treated by a veterinary surgeon. The treatment included intra-mammary injection of 4 tubes of Sinulux, at 12 hour intervals. This was followed by a five day treatment with Tylosil and a subsequent five day treatment with Oxytetracycline. After antibiotic treatment the infected animal’s milk continued to test positive for L. monocytogenes. All environmental swabs were negative for L. monocytogenes, except the milk filters from the bulk tank and the floor of the dairy beside the bulk tank. The isolates obtained had indistinguishable PFGE profiles from the original milk isolate. Once the cow that was excreting L. monocytogenes into the milk was identified, the milk from individual quarters was examined (Table1). L. monocytogenes was excreted from only one quarter, and this quarter also had a higher Somatic Cell Count (SCC) than the other quarters, although it was still within acceptable limits. Detailed analysis of the milk was undertaken on several days (Table2). The milk was positive for L. monocytogenes on all dates tested. In addition, TBC and SCC were elevated. Fat, protein and lactose concentrations were generally within accepted limits. The average pH of infected bulk milk was pH 6.81(n = 5). L. monocytogenes contaminated milk samples tested had enumeration results of <10 cfu/ml for coliforms and S aureus. Table2 shows total bacteria count values for L. monocytogenes infected milk and the fat, protein lactose, casein and SSC results for both the infected milk and the non infected bulk milk. All L. monocytogenes strains isolated in this study had indistinguishable PFGE profiles (Figure1) and were all serotype 1/2a. PFGE profiles of L. monocytogenes from bulk tank milk. L. monocytogenes has been described as a “less common cause” of bovine environmental mastitis and may often be associated with the accidental introduction of the organism during intramammary infusion. Mild persistent, antibiotic resistant, low grade infections have been documented in cattle and may result in decreased production from infected mammary tissue over time. In addition, L. monocytogenes infection and secretion may have potential public health implications for susceptible consumers, if raw milk is consumed. L. monocytogenes has been isolated from different species and from soil, plants, mud, pasture, waste water and streams. Cattle and many other animal species excrete L. monocytogenes in their faeces. Controls to reduce the level of contamination and infection include such measures as the pasteurisation of milk, rodent control and common practices of dairy husbandry, personal hygiene and environmental management. Animals with encephalitis or those that have aborted should be isolated and all in contact material including placenta and foetuses aseptically removed and destroyed. In cases of L. monocytogenes contamination of milk, the most likely source of the listeria is from the environment post-milking. Direct excretion of L. monocytogenes into the milk, i.e., clinical or sub-clinical mastitis is rare. In this case, L. monocytogenes contamination of a bulk raw milk sample led to an investigation of the source of contamination. Environmental swabs from the dairy environment were negative, except for milk contact surfaces. It is possible that the contamination from the dairy floor led to contamination of the milk, but with milk contamination lasting for several months, this is unlikely. Previous studies of L. monocytogenes contamination of raw milk found that animal faeces, poor quality of feed and general lack of hygiene on the dairy farm are factors associated with contamination[3, 26, 27]. Biofilms formation has been known to cause adhesion and persistence of L. monocytogenes onto equipment. Levels of hygiene on the farm involved in this study were visually very good, and all non-milk contact dairy environmental swabs were negative, indicating the source of contamination was direct excretion into the milk. Following a visual inspection, none of the cows in the herd had any physical signs of infection. The L. monocytogenes contamination in the bulk milk was further investigated in herd milk testing. Using segregated composite bulk milk sampling (20 cows per sample), one mammary quarter from one cow infected, without any clinical or sub-clinical signs of mastitis was eventually identified. This infected cow was segregated from the herd; the bulk milk was then L. monocytogenes negative. After the cow was segregated from the herd, the SCC results of the contaminated milk samples increased (Table2), indicating sub clinical mastitis, although the stress of separation could also result in increased SCC counts. In dairy cattle herds with mastitis it is found that in almost all cases where Listeria occurred, only one quarter is infected, and 95% of cases yielded a pure culture, similar to the results of this study. Part III, to Regulation (EC) No 853/2004.) However, no visual defects in the milk, nor clinical signs of infection were seen in the infected cow during this study. Testing of the infected cow and the remaining bulk milk was carried out for a further 2 months (6 months from initial identification of the problem). Over the 6 months of testing, all the strains of L. monocytogenes from the infected milk were indistinguishable when characterised by PFGE (Figure1) and serotyping, indicating that the same strain of L. monocytogenes was persistently present in the infected milk. The persistence of infection was also reported by Bourry 1995 with sub-clinical mastitis. With sub-clinical listeria mastitis, cows not showing any clinical signs go undetected where they may produce milk with normal appearance containing large numbers of pathogenic L. monocytogenes[15, 16]. Clinical mastitis is, by definition, abnormal milk and no reference to SCC is required. The presence of flakes, clots, or other gross alterations in appearance of quarter milk is evidence of clinical mastitis and is by definition, abnormal milk. In this study we find bulk raw milk to be directly contaminated from a case of L. monocytogenes infection in a dairy cow. The SCC was slightly elevated from the infective quarter with no visual defects in the milk, or clinical signs seen of infection in the cow. 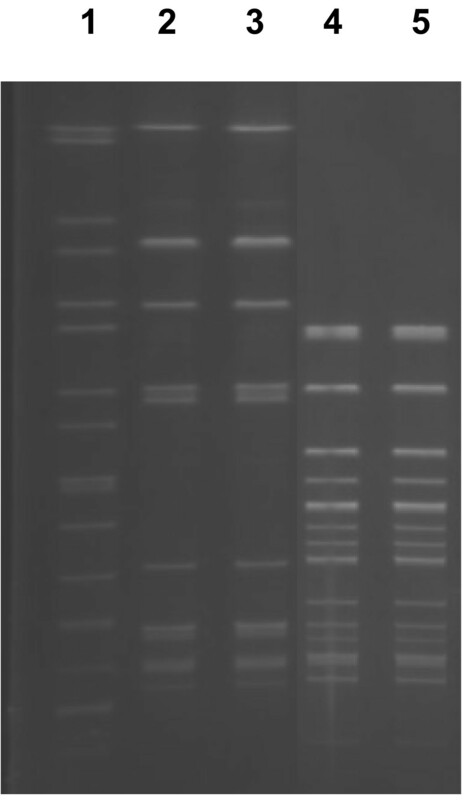 This L. monocytogenes strain was isolated from all milk samples and by molecular characterisation, found to be a pure and persistent isolate over a 6 month period, even after antibiotic treatment. Karen Hunt was in receipt of a Teagasc Walsh Fellowship. The authors gratefully acknowledge funding support from the Irish Government under the Food Institutional Research Measure Irish Microbial Risk Assessment Network project, and the EU 6th Framework Programme under the project BIOTRACER. KH, KJ and ND carried out sampling and molecular genetic studies. KJ, MM, JB and FB planned the work and drafted the manuscript. All authors read and approved the final manuscript.